Scooper - Technology News: How can Latin America kickstart economic growth? How can Latin America kickstart economic growth? Latin America is facing an economic slowdown. Between 2003 and 2008, Latin American countries grew at an average annual rate of 5.2%, according to the IMF . 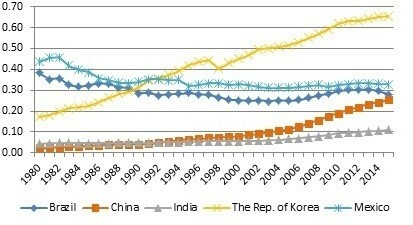 The period was one of growth acceleration, as the region in previous years (1999-2003) posted an average growth of 1.7%. But since 2010, the region has experienced continuous slowdown. Growth is projected at -0.3% in 2015, down from 1.3% in 2014 and 1.2 percentage points below the forecast in April 2015. Meanwhile, the global economy has changed and the commodities boom is over. The region has been affected by the international trade slowdown as a result of slower global demand, the fall in global prices of its main commodity exports since 2012, and the instability of global financial conditions. Regarding the latter, interest rates have been rising in the US, exposing markets in developing countries to a risk of reversal in capital flows. Low productivity is the main challenge for the region, which was not able to narrow the significant productivity gap with advanced economies, despite periods of sustained economic growth. The recent shifts in the global economy, with developing economies’ share of global GDP surpassing that of advanced countries in 2009, are in large part due to the performance of countries in Asia. Considering a simple indicator of “convergence” – which relates to the GDP PPP per capita of developing countries and the GDP PPP per capita of the United States – the difference between Latin America and Asia is emphasized further. Despite a lower level of GDP in the beginning of the period, the performance of the Republic of Korea is well above that of Brazil and Mexico, two of the major Latin American economies. As a reflection of the slowdown in growth rates in recent years, convergence is not sustained. China and India show a persistent convergence trend, starting from very low levels of GDP per capita in the initial years. An end to the demographic bonus? All Latin American countries are experiencing demographic changes, despite differences in pace and intensity. The population in the region is ageing. In the process of demographic transition, Latin American countries are on the whole experiencing a “demographic bonus”, where the proportion of the working age population grows relative to the dependent-age population. As a result, the region’s dependency ratio is declining. That’s good for economic growth, as the labour force participation rate may rise and, as spending to support the needs of dependent population falls, savings and capital accumulation may increase. But a turning point could occur as soon as 2019, when the youth and working age population will grow slowly or decline and the older population will grow steadily, which will increase dependency ratios, constraining economic growth. When this happens, the only thing that will boost the economy will be productivity gains. Latin America has to act on the productivity front if it is to increase growth and reduce poverty. The expansion of production based on what is called factor accumulation – an increase in the quantity of human capital – is limited by the availability of labour and capital. In the scenario of slower growth, less favourable external conditions and a fading of traditional drivers of growth, improving productivity will become critical to sustaining economic growth and the convergence of developed countries’ incomes. The fact is that expanding production will be largely dependent on the growth of productivity and the only way to increase it indefinitely is through innovation. The good news is that, due to the productivity heterogeneity between firms, this can be done fast and at low cost. It is possible to reduce the gap. Each Latin American country will need to have its own assessment of its productivity bottlenecks. There are many tools available to help make this assessment. But certainly there are some common areas that deserve attention such as quality of education, infrastructure, scale, management and technology. Tackling these challenges will require actions in different areas of government (regulation, debureaucratization, trade and investment policies, for example) and at the company level. As this framework shows, there are many areas to be attacked in order to increase productivity. Each Latin American country has to do their own valuations – and then get to work.